As promised a few posts ago, here is my second cocktail recipe! 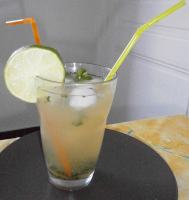 For me, the mojito is one of the best drinks, it's both tasty and refreshing. Sadly, in France the price is usually awful, and the mojito really not that good. In such cases, it is better to do everything yourself, you won't be disappointed! I was lucky to have a great friend to teach me this recipe! So, the following will probably be different from what you see in your favourite bar, but I love it! In a big glass, put the brown sugar and the mint. Crush the 2 together (if you don't have the right tools, use the hand of a knife, or something of the same shape, but don't cut yourself!) Really crush, not just once or twice to pretend you have done it: with this process, you need to "destroy" the mint leaves to unleash their perfume. Press the lemon and add the juice to the glass. Stir well, pour the rum and a lot of crushed ice. Fill the glass with some water. Advice: don't drink it in the minute. It's better to let it rest a few minutes, so that it's cooler. Then you will enjoy all the flavours. It's important to stir to the bottom, so that you get all the sugar in the end. Don't be afraid to put sugar: it really helps to the flavour. 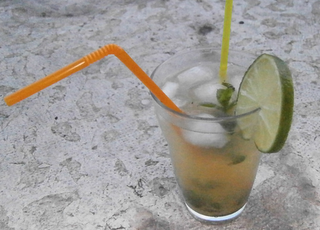 A mojito without (or with little) sugar is a sad mojito :) Same for the rum. Sadly they often put too much water in the bars, and it tastes like... water. Often people leave the lime quarters in the glass. Why not, but the juice will not be mixed as well with the rest of the ingredients. Moreover, there already are so much stuff in the glass, that you don't really need to add to it! The best is to serve with to straws: one to stir, one to drink.